One of the useful services offered by United States Postal Service is the USPS certified mail. This service is extensively used by the customers of USPS throughout the country. Here, in this article, we will talk about this service in detail. We will talk about what is the certified mail, and things like how long does the certified mail take to reach its destination, how to send it, and much more. We will also put some light on other important things related to it, like who can send it, how much does it cost to send a certified letter and its return receipt. So, go through the article in detail, and get to know one of the most delightful services offered by the US post office – the certified mail. 2 How to Send Certified Mail? 2.1 How Long Does Certified Mail Take? 2.2 Who Sends Certified Mail? You can get the e-verification by punching in the tracking number given to you on the USPS site. Lastly, you can e-verify the Certified Mail delivery by bulk electronic file transfer. This bulk electronic file transfer is for the mailers who can give an electronic manifest to the US Post office. In the Certified Mail service, the Proof of the Delivery Record is not mailed to the sender on its own. But, a client can ask for a signature proof when he is going to mail his documents by buying a return receipt service. 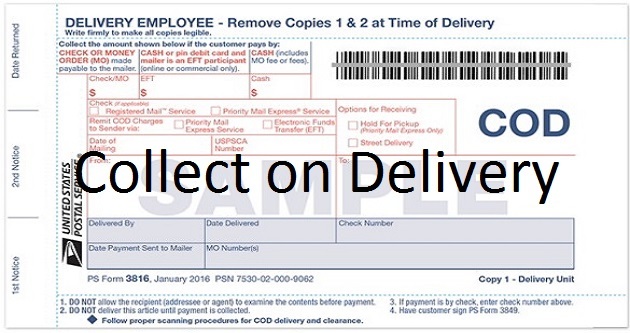 The customers of USPS can also get the return receipt via mail or electronically. 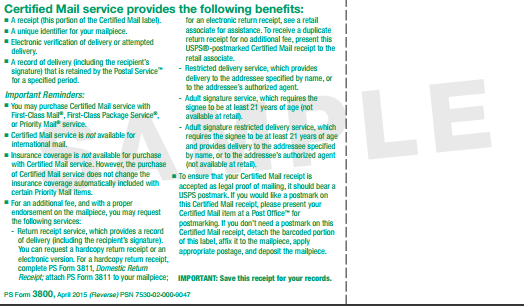 If a customer has not got his Return Receipt which he purchased at the time of mailing, then he can get the delivery information by filling the PS Form 3811-A completely, Request for Delivery Information or the Return Receipt, within the 90 days of the date which is mentioned on the us postal service certified mail receipt. One can file a refund of this service. A customer can do a certified mail online tracking by logging to the official site of the USPS. By tracking it, the customers get to know the updated information about their mail. These items may be mailed to any of the APO (Army Post Office), FPO (Fleet Post Office), and DPO (Diplomatic Post office) locations. The customers should also note that they might have access to the delivery information for the items destined to APO or FPO or DPO locations. This service is not possible for the International mails. Though one can mail to APO, FPO, and DPO locations. USPS keeps a record of delivery. This includes the signature of the recipient. It is kept at the Post Office of delivery until two years from the date on which the same was mailed. Do you have to sign for certified mail? Yes, this mail needs a signature to be taken at the time it is delivered. How to Send Certified Mail? Ask for a Certified Mail Form or PS Form 3800. As you get this form, you need to know how to fill out this mail. You have to fill all the essential information asked. In the form, you will notice that there is a sticker that has a barcode. This barcode will enable you to track your mail through USPS. You will also see that there is a receipt. This receipt is nothing but a proof of sending certified mail. Now, you need to put the sticker on the envelope. You should put that sticker that you have received with the form, to the right-hand side of the return address on the given envelope. 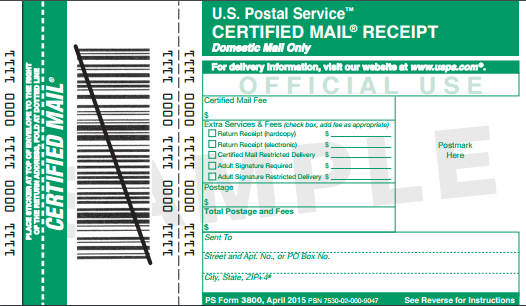 The next step of knowing how to send certified mail is to make a payment for the postage. You need to pay for the postage and the mail class which you are using. You can also buy the Restricted Delivery, Return Receipt, or any other add-on service when you are going to mail your package. After buying the service you need, now carry on sending a certified letter. The first step of USPS certified is to create an account. There are many online businesses that offer this service of certified letter or mail delivery. You can choose one of those to get your mail delivered. All you need to do is to make sure that the business provider you have chosen provides the facility for the USPS tracking. This is needed to track your mailed letter. You can track your mailed letter from the very next day of mailing. You also need to make sure that they provide you the mailing proof and also the USPS Proof of Delivery. The next step of sending the mail online is to prepare the letter. Now that you are quite sure that which online service you are going to use, now you have to keep the letter ready that you are going to send. To know how to write a certified letter, you need to write the letter in any word program. The next thing to do is to take the print out of the same. You can also sign the letter in case you wish to. The last step is to scan and upload the letter. You can scan your letter using a scanning machine. After scanning the letter in the scanning machine, upload the same onto the website of your service provider which you are using. These were the two methods of knowing how does certified mail work. Please note that you are required to keep all the originals and the photocopies of all the documents like the mailing proofs and records and also the copy of the add-on services you have taken. How Long Does Certified Mail Take? Certified mail can take around 3 days to 10 working days for the delivery if a client sends the same through First Class mail delivery. If the customers upgrade it using the Priority Delivery service, then it will take just 2 to 3 working days for the mail to reach its destination. The clients who are looking to mail some confidential, legal or the sensitive documents are the ones who send certified letters. The USPS customers cannot send their items using the post certified for the above-mentioned categories of USPS services. For any other service or in any case of confusion, you must contact the US post office to get the clarity on the same. 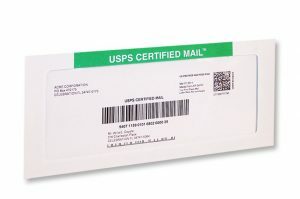 This is the answer to the most commonly asked question; how much is certified mail? The user must visit the Post Office. One can also visit any branch, or station to obtain a valid receipt. The receipt may be sent from the home or from the office. The user can also drop the same in a Collection Box receptacle. Though the Aviation Mail Security restrictions may apply over here. The receipt may also be handed over to the employee of the post office. However, one should make sure that the postage attached to the envelope must consist of the certified fee and also the postage. The customer can buy this return receipt while he/she is mailing his package. Please note that the PS Form 3811 is only available if it is accompanied by the Adult Signature options. You will have to agree that USPS, an esteemed organization, offers the unthinkable. You name it and you have it. A USPS certified mail letter is one of the finest service provided by the USPS like several other services. This service is yet another beneficial service as the kind of security and surety this service offers, is unparalleled. Happy mailing!